Vientiane (VNA) – Vietnamese Ambassador to Laos Nguyen Ba Hung visited the headquarters of the Commission for External Relations of the People’s Revolutionary Party (LPRP) Central Committee in Vientiane on March 20 to extend congratulations on the LPRP’s 64th founding anniversary (March 22, 1955-2019). The Ambassador was received by Sounthon Xayachak, member of the LPRP Central Committee and head of the LPRP Central Committee’s Commission for External Relations. Ambassador Hung expressed joy and pride at the great accomplishments that the Lao people have made during the struggle for national liberation and national construction and defence over the past 64 years. He voiced the belief that despite certain difficulties and complicated developments in the regional and world situations, the Lao people will continue to reap even greater success under the sound leadership of the LPRP. The Vietnamese diplomat underlined the contribution made by the LPRP’s Commission for External Relations to the achievements of the Lao people, stressing that the commission’s advisory role will become more important in the period of international integration. 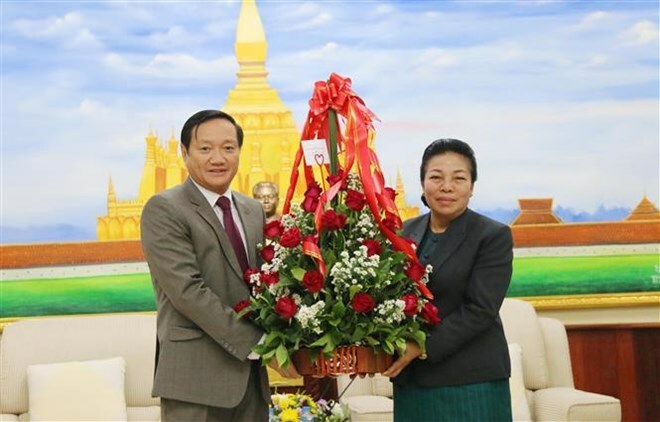 He wished for continued coordination between the LPRP’s Commission for External Relations and the Vietnamese Embassy in Laos for the effective implementation of agreements signed between Vietnam and Laos. For her part, the Lao party official expressed deep gratitude on behalf of the LPRP, State and people of Laos to Vietnam for the valuable, practical and timely help that Vietnam had provided for Laos during its national liberation struggle and national construction and defence. She said the Lao party, State and people are proud to have a faithful friend like Vietnam, stressing that all successes of Laos are connected with Vietnam’s support. Sounthon Xayachak affirmed that the great friendship, special solidarity and comprehensive cooperation between Laos and Vietnam will never change regardless of whatever happens in the world.